16/05/2007 — Acquisition — Paris, Musée du Louvre — The beautiful exhibit devoted to Charles Mellin at the Musée des Beaux-Arts in Nancy, which we will soon talk about, provides the opportunity of showing the public the Portrait of a Young Man (ill.) which the Louvre has just purchased in Paris from the Jacques Leegenhoeck Gallery. The painting had been displayed at the last Biennale des Antiquaires. This work can be compared particularly to various men’s portraits dating back to the first decades of the XVIIthC, painted in Rome under Caravaggism influence. The young age of the subjects, the simplicity of the layout, the directness of the look, imply informal portraits undoubtedly representing figures of the artists’ direct circle, and similar to simple head studies . This formula was practiced by French artists  as well as by Bernini and his circle or by Diego Velazquez. 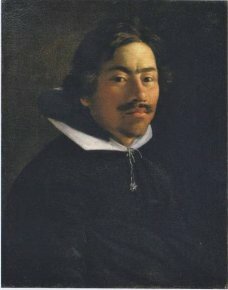 Charles Mellin, proves himself very close to Vouet, with whom he collaborated before the latter left for Paris in 1627. One can thus compare this painting to the Self Portrait by Vouet (Arles, Musée Réattu) and also to the Portrait of a Young Man at the Louvre. The Portrait of Marcantonio Doria, another Vouet at the Louvre, painted in Genoa in 1621, is rather different, if only because of its monumental size and its less spontaneous nature. The Louvre until now had only one painting by Mellin, acquired in 1985, Roman Charity. As Philippe Malgouyres explains in the catalog to the exhibit. See especially : Jean-Pierre Cuzin, “Jeunes gens par Simon Vouet et quelques autres”, Revue du Louvre et des Musées de France, 1979, n° 1, p. 15-29.